The US defense secretary says relations with Russia have taken a “sad turn” and he will meet with US military leaders and diplomats in Europe to assess NATO's tactics toward Moscow. It comes two days before Obama will discuss Russian sanctions at the G7. "We have something that has taken a sad turn recently, which is Russia," US Defense Secretary Ashley Carter told troops at the US Africa Command in Stuttgart, Germany. 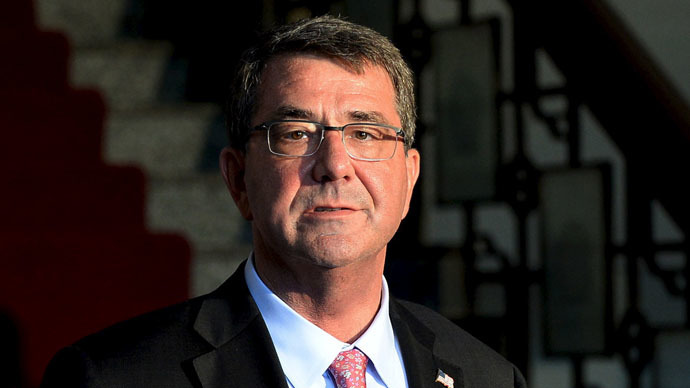 The meeting between Carter and two dozen military leaders and ambassadors based in Europe is scheduled to take place Friday at the headquarters of the US European Command in Stuttgart, which controls US forces in the region. US forces have been increasingly active in Europe in recent months, leading a massive series of NATO military exercises, collectively dubbed Operation Atlantic Resolve. Alliance and US military leaders have repeatedly said the operation is a message to Russia, which NATO has labeled an aggressor and accused of involvement in the Ukrainian conflict. NATO has also formed a rapid response force in Europe, with an aimed total strength of 30,000 troops. Moscow has said that Kiev is fighting a civil war with its citizens in eastern Ukraine, not with Russian forces. The Kremlin has consistently and adamantly denied any presence of Russian troops or hardware in eastern Ukraine, pointing out that there is no evidence proving otherwise. However, Washington keeps blaming Russia - even to the point of ignoring international observers' reports. On Thursday, State Department spokesperson Marie Harf told RT's Gayane Chichakyan that recent violence in Ukraine was the fault of "separatists and Russia" - failing, however, to provide any backing for her words. Carter's trip to Stuttgart will, among other things, evaluate how effective Western sanctions and military actions have been in deterring Russia, US defense officials said. When asked if the meeting would include the discussion of providing Ukraine with lethal weapons, an official said Carter was still open to the idea, and that the issue could come up. There have been calls from US officials to supply lethal weapons to Kiev for months now, including from General Philip Breedlove, the head of US European Command and NATO forces in Europe. Ukrainian officials, like Prime Minister Arseniy Yatsenyuk and President Petro Poroshenko, have been asking for weapons. An agreement for "defensive" lethal weapons supplies has already been reached with 11 countries, according to an analytical report for Poroshenko’s annual address to the parliament. Kiev's parliament has also recently signed a law allowing unhindered access to the country for foreign troops on peacekeeping missions, should they answer Kiev's request. Kremlin has reacted by warning Ukraine against any provocative action, saying it is “very important to avoid any actions or steps that provoke escalation of tension,” RIA Novosti reported Dmitry Peskov as saying. With violence rising again in southeast Ukraine, Moscow has once again reiterated its calls “to concentrate on implementation of [Minsk] agreements,” Peskov said. The new bill on international peacekeeping missions in Ukraine contradicts the Minsk agreements, Russian State Duma MP Leonid Slutsky said. “Minsk-2 did not provide for peacekeepers in resolution of the national conflict,” Slutsky said, Tass reported. On Thursday, Washington announced that Obama plans to urge EU leaders to keep sanctions in place against Russia at the two-day G7 summit, which will begin Sunday in the German town of Elmau. “The president will be making the case to his European colleagues that the EU should move ahead and extend sanctions when they meet at the end of this month,” said White House Senior Director for European Affairs Charles Kupchan.